Used paperback: .1992 edition Paperback book good condition. The End of Certainty is a classic study of power, personality and national destiny. 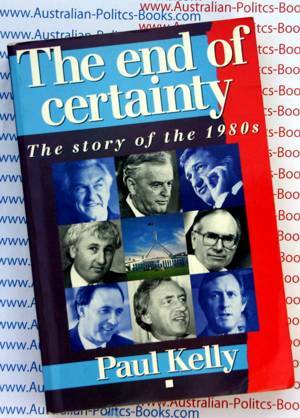 From boom to recession, Hawke to Keating, and Labor's victory for the 'true believers' in 1993, Paul Kelly has written the ultimate inside story of how the 1980s changed Australia and its political parties forever. His detailed scrutiny of the inner working of the Hawke-Keating partnership and its slow disintegration, his unravelling of the crippling rivalries for the Liberal Party leadership and his burrowing into cabinet room struggles over the deregulation of Australia's financial system reveal the brutal realities of Australian politics and how it is played at the very top. But above all, he reminds us of the sheer pace of economic and social change the country lived through and the wake of uncertainty it left behind. A Fellow of the Academy of Social Sciences in Australia, he is currently Adjunct Professor of Journalism at the University of Queensland and a participant in the Australia-America Leadership Dialogue. In 2002 he was a visiting fellow at the Kennedy School of Government and a visiting lecturer at the Weatherhead Center for International Affairs at Harvard University.